The Citation Excel is part of the very successful Cessna Citation line and is a direct modification of the Citation V. The Citation excel combines the wing of the Citation Ultra with the short fuselage of the Citation X. The Excel is recognizable by its low/swept wing with twin rear fuselage mounted engines and large cockpit windows. It has a swept tailfin with mid mounted horizontal stabilizer. Each side of the Excel’s fuselage has 5 passenger windows. The Excel aircraft carries up to 8 passengers and has a 2 man flight crew. 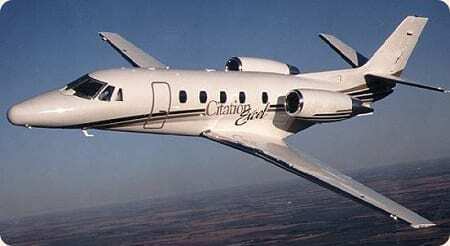 The Citation Excel cruises at speeds up to 429 knots and has a range of 2080 nautical miles.